It’s been an exhilarating few days. You just spent four days on safari in Tarangire National Park, one of Africa’s most underrated parks. Your guide drove you over hills and around baobab trees to see huge herds of elephants, spot lions sleeping in trees, and hear zebras barking late into the night. Your Tanzanian adventure isn’t over though. Now you’re off to see a completely different landscape—as well as wildlife—on a gorgeous island in the Indian Ocean. Pemba Island sits in the Pemba Channel across from the mainland. It’s part of the Zanzibar Archipelago, a semi-autonomous region that, upon gaining independence, united with Tanganyika to form Tanzania in 1964. The island has been ruled by sultans, marred by political violence, and haunted by witchcraft throughout its fascinating history. Tourists have only recently started to explore the Green Island. The hilly island has a single paved road. Clove, coconut, and banana farms cover most of the interior. Some of the oldest ruins in Africa lie outside of Chake-Chake, the small capital. Deserted beaches line the coast. While rich fishing grounds and some of the top diving spots in the world are just offshore. You learn all of this on the bumpy drive to Pemba Island’s northern tip. This remote part of the island is covered by the Ngezi Forest Reserve, a primary forest that’s home to Pemba flying foxes, vervet monkeys, and Zanzibar red colobuses. The British-built Ras Kigomasha Lighthouse features a tiny staircase and views across the island. Vumawimbi Beach might be the island’s most beautiful spot. While a small resort offers close encounters with nature and a staff that acts more like family. You’re welcomed to the Manta Resort with a cold towel, spiced iced tea, and a view of the bluest water you’ve ever seen. Your fundi—part butler, part tour guide, part magician—points out different parts of the resort as he escorts you to your room. 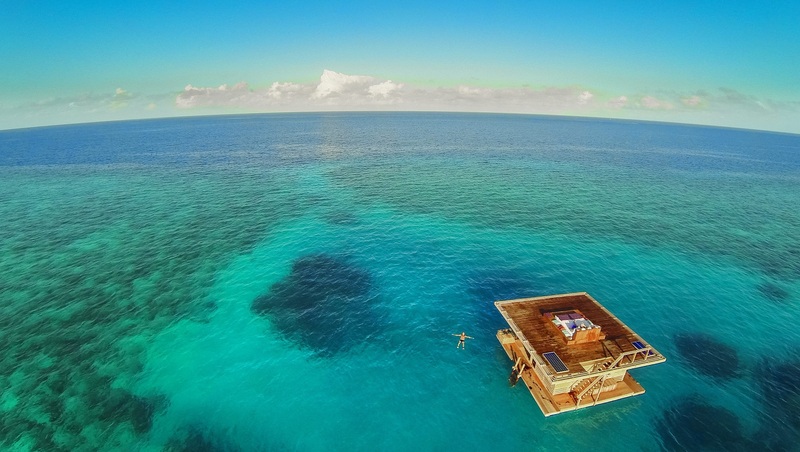 Your options range from a simple garden room to a unique underwater room (a private, floating island in which the bedroom is four meters below the water). You opt for a traditional seafront room though. 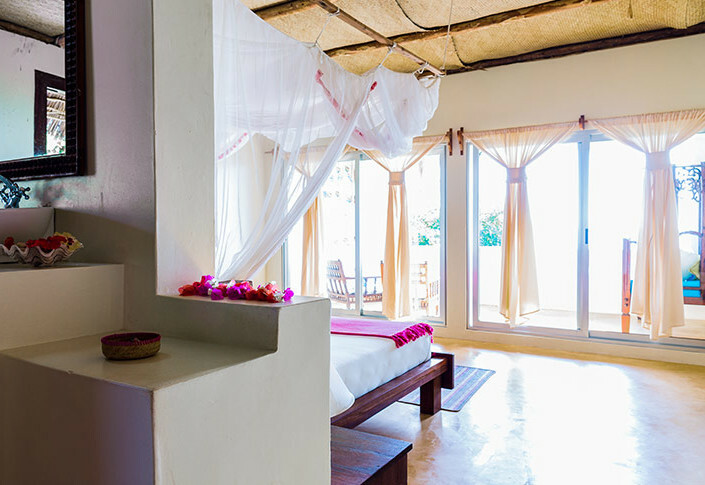 The whitewashed cottage has a makuti-thatched roof and a spacious sun terrace. But its focus is clearly on the water. Yours soon is, too. Your first stop is the beach, of course. Handwoven sun loungers and hammocks sit under palm trees on the warm, white sand. A wide wooden swing hangs in front of the sandy floored beach lounge, where handpicked mangos, pineapples, and limes are blended with a touch a rum for a refreshing drink. The two-tiered pool, in which you might finally take a scuba-diving lesson, is just steps away. Your room rate includes one treatment each day at the Kipepeo Spa—you’re thinking about starting with a Swahili head massage. Plus most meals, featuring freshly caught seafood, are served on the main veranda that overlooks the water. You could sway in a hammock, sip a fruity drink, and watch the waves lap against the shore the entire time you’re on Pemba Island, but you shouldn’t forget the point of this trip: a safari. So after you relax and enjoy your head message, make plans to explore. Stick to snorkeling along the House Reef—where you’ll see nudibranchs and big-eyed squid—since you haven’t completed your scuba-diving certification yet. Walk through the nearby forest and keep an eye out for Pemba sunbirds and lots of monkeys. Search for baby sea turtles making their way to the water on the otherwise empty beach. Struggle with an enormous sailfish from a dhow off the west coast. Or get dropped off—with a cooler full of fruit and drinks—on a deserted sandbank surrounded by the azure water during low tide. Okay, the last excursion has nothing to do with the safari, but it will certainly be a Tanzanian highlight.